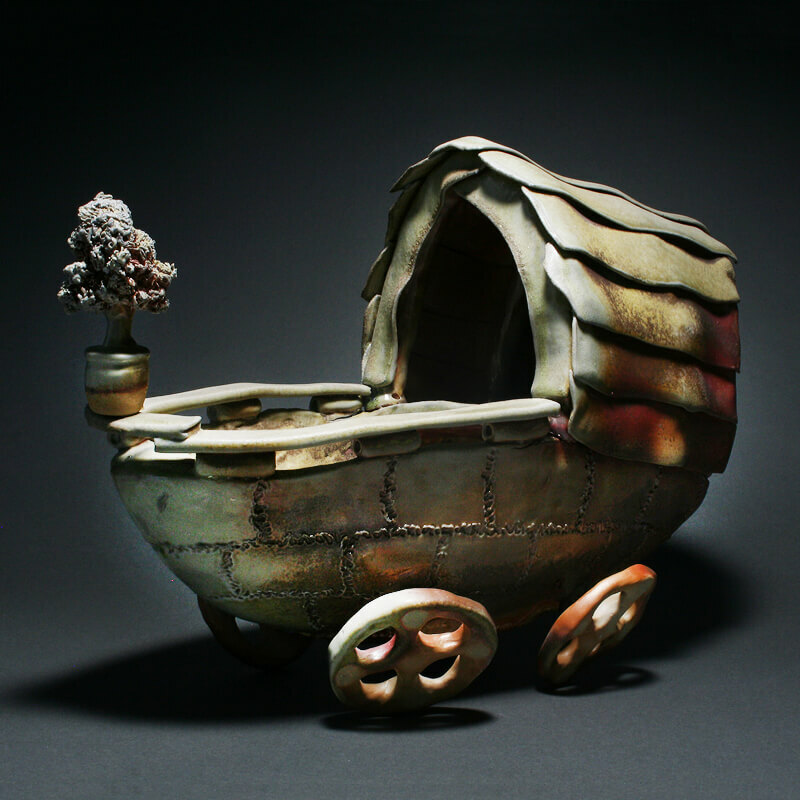 Mike Roche is a ceramic artist originally from the Greater Boston area of Massachusetts. As an adolescent, Roche studied oil painting with accomplished landscape artist Peter Roux, while attending high school where he studied Advertising Art and Design. After graduating high school, he decided to pursue a bachelor degree from Massachusetts College of Art and Design with the intention of concentrating in painting. During his freshman year, he took his first course in ceramic hand-building and fell deeply in love with the mediums endless possibilities. Being able to create three dimensional forms and then apply his painterly sensibilities to those forms was an irresistible and welcomed challenge for him. During his last year at Mass Art, he had the good fortune to meet world renowned ceramic artist Jun Kaneko, who after seeing Roche’s thesis show, invited him to work as his assistant in his Omaha Nebraska studio. Over the next four years, Roche worked for Kaneko taking part in every operation necessary to run the expansive and prolific studio. Most notably, he fabricated over forty of Jun’s ceramic sculptures ranging from 2‘ to over 11‘ tall. He had the honor and pleasure of designing Kaneko’s newest and largest kiln to date, which can accommodate several 11’ sculptures at one time. Roche would put in over fifty hours a week of back breaking work in Kaneko’s studio, but somehow still made time for his own personal studio practice. He participated in many local gallery shows during his time in Omaha. In 2012, Roche received a full scholarship from the University of Delaware to pursue his graduate degree in ceramics. During his time in Delaware, Roche not only continued to explore the scale of his sculptures but also evolved the complexity of his surface treatments on the forms. He also had the responsibility of teaching several courses and was afforded the opportunity to design his own curriculum. After obtaining his graduate degree, Roche moved back to Massachusetts to reconnect with his roots and become involved with the local clay community that had so greatly influenced and inspired his current journey as a contemporary ceramic artist. Since then, Mike has received a year long artist residency at the Feet of Clay studio in Brookline,Ma; and was also awarded the 2015-2016 artist residency at Mudflat Pottery School. He currently works and teaches in Spencer Massachusetts and continues to exhibit his art throughout the U.S.
My work is best described through a confluence of ideas, interwoven and at times contradictory. I make ceramic objects, environments, and dwellings as a way to explore utopian concepts and dreams. I’m interested in the different ways in which the objects and environments that surround us impact our lives, and am inspired by possibilities for progression and improvement. I believe the forms, surfaces and arrangements of objects in our physical world can have a direct impact on our mental space, and am drawn to explore the potentials of how formal qualities within our surroundings can alter both the physical and psychological spaces we occupy. As a creator I work out my ideas through process. The act of making provides a forum for me to think and reflect. Ideas function as a starting point; the time spent building forms, creating textures and establishing a relationship within their surroundings is where the body of the work comes to life. The play between the physical world and the dreamscapes I’m representing allow me to specifically investigate how different qualities in form and material speak to people’s psychological interpretations. All of my works contain an underlying utopian and surreal perspective meant to mirror and reflect life and society. The generation of my art allows the contrast between utopian visions and reality to be emphasized and illuminated while offering new perspectives and ideas for the future.